It is no longer news that every quarter Qtaby Events treats socialites to an evening of exclusive business networking on a boat after an extravagant red carpet with cocktails and a lot to eat and drink. Each edition of #CruisenChillz comes with a lot of surprises as they launch a new brand and give an exciting twist away from the previous edition. We are used to having the eccentric Denrele Edun host beside a new hot chic for every edition but the script has been flipped for the fourth edition as Victoria Nkong: The C.E.O of Qtaby Events announced the sizzling and super talented coach of The Voice: Timi Dakolo as the male host for this edition, co-hosting with him is Alex Okoroji, former Tinsel star, actor, Talk host, author and Queen of the Naked Expression. DJ Nana will also be on the wheels of steel. This edition promises to be another level as guest will have the opportunity to fore-taste “OLAJUMOKE SAUCE”; Yes, The Vlog and Reality Series centered around Nigeria’s Modern Cinderella: Olajumoke Orisaguna will be premiered live on a boat on the Lagos waters. Pay into Qtaby Events Ecobank account number: 093200125 then send your name and address or Call 08112824176 for ticket to be delivered to you. Limited tickets are also available on Dealdey. 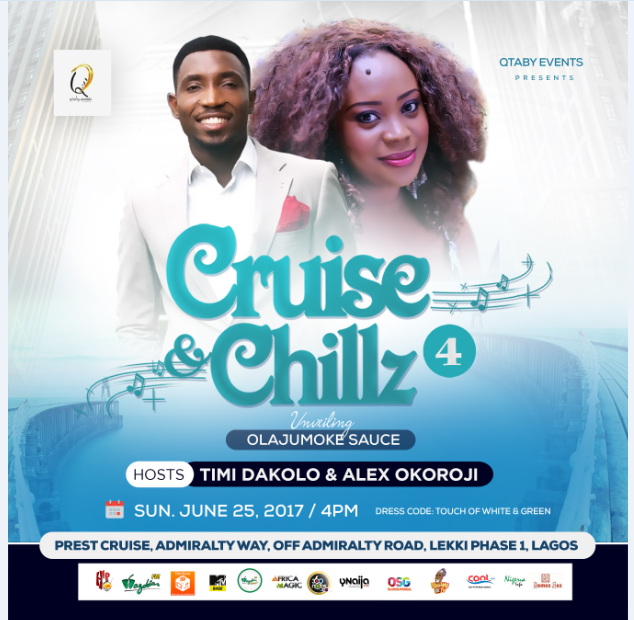 Cruise & Chillz is brought to you by Qtaby Events and supported by YNaija, Homes Rez, Ntertane, MTV Base, African Magic, HipTv, Olorisupergal, Cool/Wazobia Radio and TV, 360nobs, KraksTV.